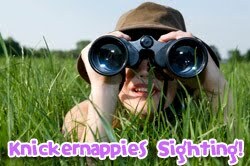 Did you know that Knickernappies makes more products than cloth diapers? It's true! We do! Check out the thorough review of our Stay Dry Nursing Pads over at Minnesota Mama's Must Haves to read up on what she calls, "The best reusable nursing pads ever!" All Natural Baby Center.com has Knickernappies' Diaper Sprayers on sale for $35.99! That's 18% off; hurry while supplies last! WolbyBug Diaper Covers are in-stock and up for grabs over at Irresistbly Green. Head on over to their shop to purchase any one (or two or three!) of these awesome WolbyBug Diaper Covers in Black, Bubbles, Spring Green, Autumn Dot, and the new print Soccer Balls.